Red Wedge is pleased to announce a call for submissions for our next issue, intended for release in late spring of 2019. The theme of the issue, our seventh, is fifty years since the 1960s. Decades are fictions, albeit useful ones. Same with anniversaries. When we mark time and look back, we can either wallow and anesthetize, or cast an eye back to the present, colliding the two in such a way that the tension reveals a future. 2019 will be the last year when we can say “fifty years since the sixties.” In Europe, North America, and around the world, that decade plays a huge role in the shift in cultural attitudes, geopolitics, and aesthetics. From events in Washington, Paris and Havana; uprisings in Detroit in conversation with those in Mexico City, sounds and images of rebellion and counterculture that echoed between Soweto, Tokyo, Prague. These are the dangerous histories, but only if we see history as a process, an unfolding in which subjectivity and expression and active engagement play necessary roles. We are looking to go to press with Red Wedge #7 in late spring of 2019, and we need submissions. We don’t wish to simply rehash what has already been said of “the fire last time.” We are looking for essays and reviews that reflect the breadth and depth of diversity in the cultural and aesthetic explosions of the 1960s, with emphasis on any ideas and narratives that can highlight how far-reaching these events and expressions were. The Black Arts Movement, the Feminist Art Program, cultural expressions of queer liberation, the arts that emerged from the strengthening of revolutionary movements in Cuba, China, Vietnam, South Africa and other regions; these are just some examples of the art we wish to revisit and reexamine. Naturally, we are also looking to publish original fiction and poetry, along with visual art, that plucks at these same or similar themes. 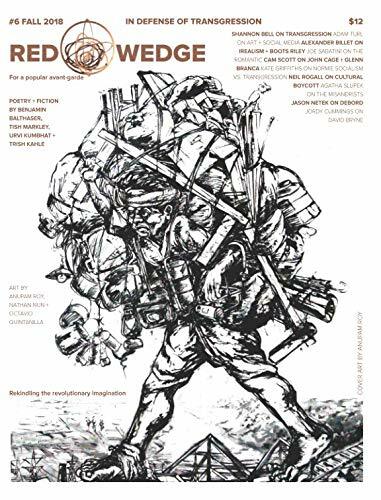 Email pitches or completed submissions to red.wedge.magazine@gmail.com. We would appreciate all submissions completed by mid-April.